I’m a big believer that when the Universe wants you to do something, it lets you know. How else can I explain that in a period of only a week, my browser landed on multiple Busy Day Cake recipes? Remember one premise of The Celestine Prophecy – everything happens for a reason and therefore, there are no accidents or coincidences. Not to get all New Age or anything, but I think that if the Universe wants me to bake a Busy Day Cake, then who am I to argue? Especially when I discover that I already have all the ingredients. My mission could not have been any clearer if the Universe itself had sent me a text message. I also think it was no coincidence that this happened after I rediscovered the happiness of cake. All of which makes me wonder, did I find those cupcakes? Or did those cupcakes find me? I may never know. But what I do know is that you should hold onto this recipe. Because when the Universe, or other company, comes calling, you can’t go wrong serving them this. Heat oven to 400 degrees with rack in the middle position. Butter and flour a 9 inch round cake pan. In a separate bowl, beat butter and 2/3 cup sugar with an electric mixer at medium high speed until pale and fluffy, about 2 minutes. Beat in vanilla, then add egg and beat well. At low speed, add flour mixture in 3 batches, alternating with buttermilk, beginning and ending with flour. Mix until just combined. Spoon batter into cake pan, smoothing top. 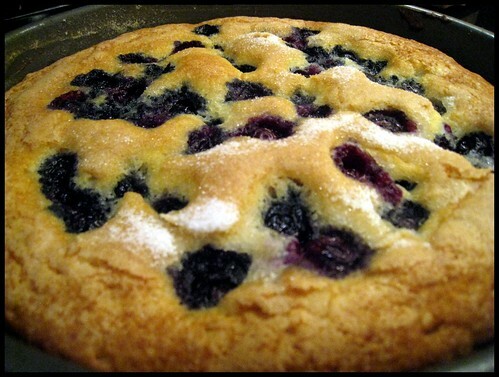 Scatter berries evenly over the top and sprinkle with remaining 1 1/2 tablespoons sugar. Bake until cake is golden and a toothpick inserted in the center comes out clean, 25 to 30 minutes, rotating pan halfway after about 15 minutes. If the cake browns too quickly, lay a piece of aluminum foil loosely over the top of the pan. Cool in pan 10 minutes then turn out onto a rack and cool 10 to 15 minutes more. Invert onto a plate and enjoy. I make something similar. It always hits the spot! YUM. This cake is lovely any time of day isn’t it?